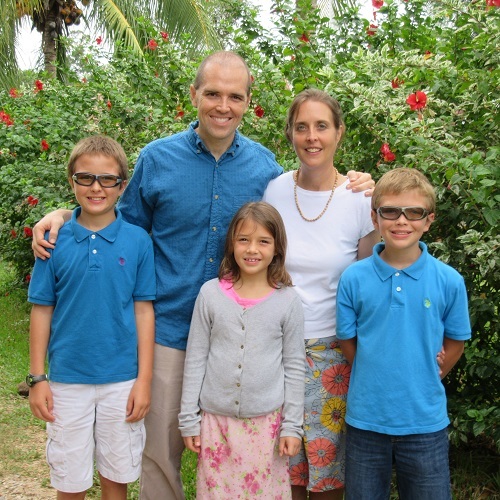 Mark and Kristin Coté and their three children, Caleb, Jacob, and Rachel, come from Lancaster, Pennsylvania. They first connected to at-risk children in Peru through the loss of their daughter, Victoria Grace, who lived for six days after her birth in 2008. That year they began Victoria’s Little Lambs Fund to help children in Peru with basic medicines and medical care. Transformed through God’s victory by His grace, and compelled by Mark’s doctoral studies on how families turn from brokenness to blessing others in the mission of God, the Coté family moved to Peru in 2014, where they serve as full-time missionaries based in the Amazon Jungle city of Pucallpa. As Director of Discipleship and Development for Kids Alive Peru, Mark serves with Kristin in pastoral ministry to abandoned, abused, and orphaned children living in poverty. They do this by equipping and caring for missionaries and national staff, teaching children and families, strengthening the educational programs, and connecting partners with this mission. Kids Alive Peru provides life-changing intervention, one child at a time, to about 500 of the most vulnerable children living on the margins of three distinct areas of Peru: Lima (Coast), Pucallpa (Amazon Jungle), and Andahuaylas (Andes Mountains). The Heavenly Father’s arm reaches out through Kids Alive International to rescue these children and raise them up through family-style residential children’s homes; community outreach through care centers (including medical assistance), and quality education through schools. In these ways, along with their team of supporters, the Coté family seeks to love Jesus by loving the “least of these.” Find regular updates and communicate with them through their “Glordinary Goings” blog, http://www.victoriasfund.com/glordinary-goings. Support the Ministry of Mark and Kristin Cote with Your Gift Today.